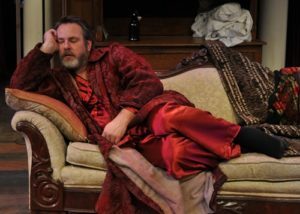 Russia’s most celebrated playwright, Anton Chekhov’s most famous play, “The Cherry Orchard” opened Jan. 20 at Kansas City’s Metropolitan Ensemble Theatre. 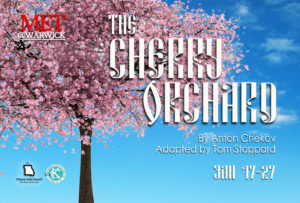 The play at The Warwick Theatre looks at a seemingly rich family, their large house and their famous cherry orchard. 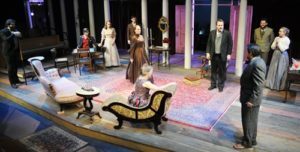 Like so many similar plots, the playwright shines the light on upper class persons who do not seem to know how to make good decisions or alter their fates. Take a look at classic literature and popular early motion pictures (many based on classic novels) and notice a trend to focus on the upper class and the problems they encounter. Kings, queens, emperors, noblemen were the focus of Shakespeare’s most celebrated plays. England’s Jane Austen, the Bronte sisters, Charles Dickens and others told tales of the affluent. In “The Cherry Orchard” a family property falls behind on bills and the entire estate could go on the auction block soon if something is not done. Even knowing of the approaching doom, nothing changes their extravagant ways as the family matriarch continues to spend money she doesn’t have for items she does not need. Suggestions to save themselves and salvage their lifestyle fall on deaf ears as they await someone to step in save them. That’s basically the plot summary. The thin plot centers on will they or won’t they save the cherry orchard. As a reviewer, I found the plot as engaging as that of “Oklahoma!” where the entire plot centers on whether Laurie will go to the social with Curly or Jud. 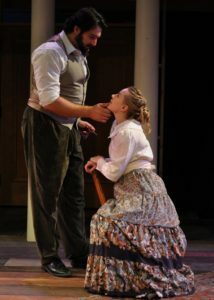 Sill, “The Cherry Orchard” remains Chekhov’s most famous play and “Oklahoma!” continues as a crowd favorite whenever produced. Both plays depict the same time frame. 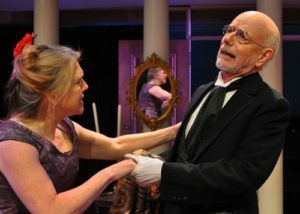 Both comedies (no one dies) differ in that Chekhov’s characters show a lack of understanding of situations affecting them. They are (or were) part of the aristocracy at a time when the social status of Russians was crumbling and a middle class was emerging. A former worker’s son has grown and now has more money and learning than the former rich. Other aristocratic characters struggle with their changing status and similarly do not understand societal changes. 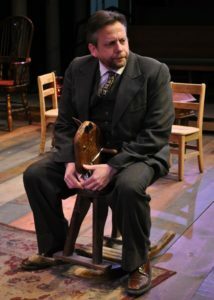 Chekhov’s characters have some depth and texture that gives the cast something to build and present. 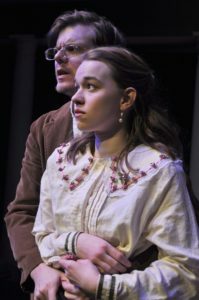 Led by Shelley Wyche and Andy Penn, “The Cherry Orchard” presents a simple story filled with several sub-plots and character twists. The cast gives this production plenty of sparks as they present the characters. Each actor brings a different texture and fullness to his or her character, ranging from comic to hopeful, to hopeless. Even the smaller roles allow the actors opportunity to make each character special and memorable. Wyche makes her character gentle, soft, and oblivious to her bad situation and can snap into a dominate strong character in a heartbeat. Her character is torn among grief for a deceased son, memories of the estate in foreclosure, and her inability to understand choices that could assist her. 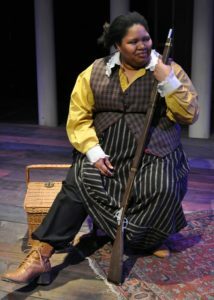 Wyche gives a rich performance with lots of subtleties. As the male lead, Andy Penn creates a character different from any of his past characters. In this case his character has risen from the poor stature of his father, tries to help the main family save their social status and money, and still seek his own personal gains. The character allows Penn to make small changes in attitude and demeanor throughout as the story unfolds. The love story of Dawn Youngs and Curtis Smith’s characters give strength and depth to the story as they, too, do not understand the social changes coming to Russia and Russian society. Youngs character knows her best chance is to marry wealth to maintain her status while Smith’s character chases dreams of get-rich quick schemes to resolve his penniless situation. Both actors create good, full-bodies characters in the show. Others that provided unique characters include Ryan Fortney as a comic relief bungling character, Alan Tilson as an aged houseman, Brandis Outlaw as a magician/mystic, and Colin Fewell as the perpetual student. Their characters and performances are memorable. The other actors give very credible performances, but the Chekhov script fails to give them much to work with. The costumes put the audience in turn of the century Russia and make the production look authentic. The sound design sets the mood before the opening lines with music perfect for the time period. The lighting featured several elements that stood out to me as I watched. But, overall, the acting and performances made the production shine. 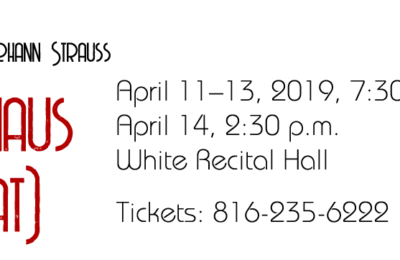 The cast is: Shelley Wyche as Luibov, Andy Penn as Lopakhin, Dawn Youngs as Varya, Christopher Preyer as Yasha, Leah Wilczewski as Anya, Justin Speer as Stationmaster, Brandis Outlaw as Carlotta, Ryan Fortney as Yepikhodov, Elaine Christensen as Dunyasha, Peter Leondedis as Gaev, Alan Tilson as Firs, John VanWinkle as Passerby/PO Clerk, Colin Henry Fewell as Trofimov, Curtis Smith as Pishchik. The creative and production team is: Todd Lanker, director; Kathy Breeden, dramaturg; Ashley Pike, stage manager; Tony Beasley, stage manager; Patty Whitlock, assistant stage manager; Marc Manley, props; Max Frederickson, sound designer; Bob Paisley, technical director; Karen Paisley and James Paisley, light design and Karen Paisley, costumes. 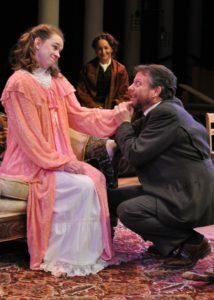 “The Cherry Orchard” continues through Jan. 27. 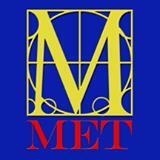 Tickets may be purchased by phone or through the MET website or at box office one hour prior to the show. Evening performances begin at 7:30 and matinees begin at 2p.m.